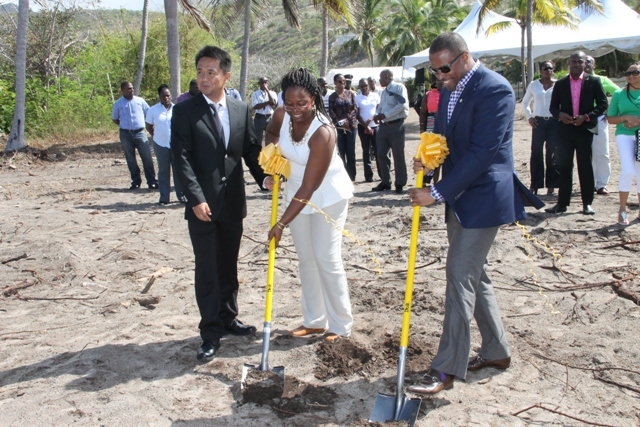 NIA CHARLESTOWN NEVIS (APRIL 22, 2015) — A US $20 million villa development project at Liburd Hill, St. James’ Parish, will provide many jobs for the people of Nevis. 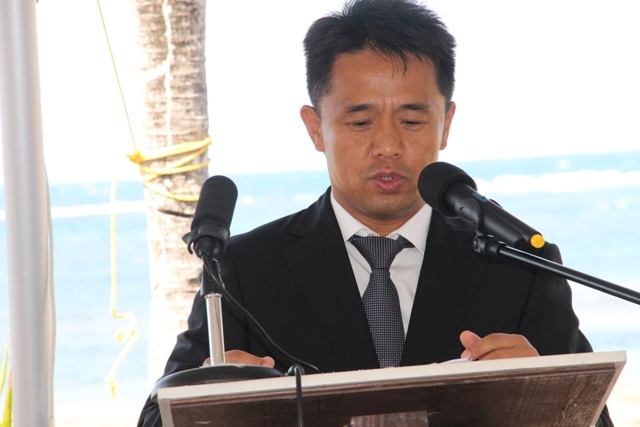 Chief Executive Officer (CEO) and General Manager of HTRIP and 1st Director of Caribbean Development Consultant Ltd. (CDCL) Mr. Jian Li made that disclosure on April 17, 2015, at a ground breaking ceremony signalling the start of construction for the HTRIP Candy Resort Villa Development. “HTRIP will develop three projects in Nevis. The Candy Resort is the first one. It is located on 4.4 acres of land and will cost US $20 million. The project will provide Nevisians with many jobs and when it is completed it will add… to Nevis as an investment destination. “The other two projects will be at Dasent Hill in St. George’s and Pot Works in St. James’. We will complete Candy Resort by December 2016,” he said. 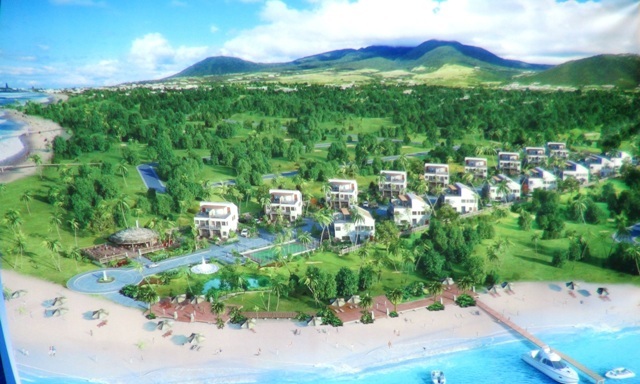 According to Li, the idea for the villa development began in 2013 and the company was looking for a destination when they chose Nevis, for its friendly people, peacefulness, beauty, economic stability and attractiveness, as a second home. He expressed confidence that the island would meet the needs of the company. Li stated that HTRIP believed in giving back and since they have been on Nevis had given donations in the area of sports and culture. The HTRIP CEO said they plan to create a local foundation to assist in the further development of Nevis economically, socially and culturally and stated that that they were here to stay. “As you can see HTRIP will be here to stay and when I am ready to retire many, many years from now don’t be surprised if I retire right here on Nevis because I am now Nevisian,” he said. 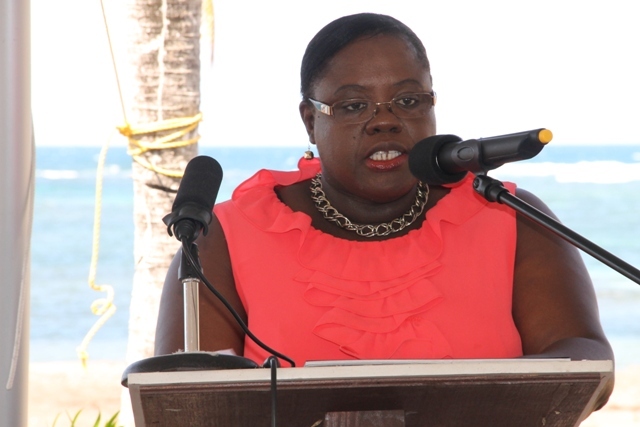 Li thanked the Federal Government and the Nevis Island Administration for their assistance. The project falls under the Citizen by Investment programme of St. Kitts and Nevis which was approved by the Federal Government for Nevis. Meantime, Junior Minister in the Nevis Island Administration, who is a resident of the area, stood in for Area Representative Hon. Alexis Jeffers. She said the people of St. James’ had been waiting in anticipation for the project’s ground breaking. Mrs Brandy-Williams thanked the investors for their decision to invest in the area and expressed gratitude for the major investment. She said the Administration looks forward to that form of partnership and to working diligently to make that major investment successful. The sod was turned by Deputy Premier of Nevis and Minister of Tourism Hon. Mark Brantley and the Candy Resort’s Local Office Executive Terrelah Byron. Deputy Prime Minister Hon. Shawn Richards was also present at the event.